Today’s post is the next in my series of posts about charities, and today we’ve got an interview from a Dogs Trust volunteer who tells us what it’s like working at the rehoming centre with the dogs on Christmas Day. Thanks to Aimee for answering my questions, and to Emily from the Dogs Trust for arranging the interview. Below is Aimee and sponsor dog Mike. 1. What’s a typical Christmas Day like at one of your centres? Christmas Day at the rehoming centre is very much a typical day so the normal cleaning, feeding, exercising and training. It’s a normal day at work for us but we try to add extra bits to make some good festive fun for everyone at the centre, two and four legged! We like to be as festive as we can be, so we wear Santa hats and Christmas jumpers to get in the spirit! In the morning it is business as usual, so we ensure all the kennels have been cleaned and the dogs have had their morning walks. On Christmas morning we try and squeeze in lots of group walks so everyone can join in! Of course, we have some dogs who would prefer the quieter way of life, so for them it’s time for some focused one-to-one training. We make sure that all dogs have a little extra fuss as it’s Christmas! It’s also lovely for us to get a bit of additional time with the dogs as we’re not open to the public. Next is Christmas lunch for all the staff which is always a team effort, prepared by everyone in the rehoming centre that day. And, it’s always delicious! Our dogs get a special Christmas dinner too. A very generous local turkey farmer kindly donates turkey leg meat which we cook for the dogs. Our dogs are constantly monitored by our veterinary team, so everything is given in moderation, and we always make sure to get a bit of veg in there too! 2. Do the animals get presents or any special treats? Our supporters are fantastic all year round with donations, but they are always extra generous at Christmas with treats and toys, which really helps the dogs feel extra special on the big day! Extra supplies come in handy after their lunch, so when we’re tucking into our dinner the dogs can savour a long-lasting chew! As we get to Christmas night and all the dogs are tucked up in bed, we go home to celebrate with our families as the next team arrive for more fun on Boxing Day! 3. How do you feel about working when other people are at home with their families? It always surprises me how many people ask if we have Christmas off, but the dogs need our love and care every day. We are their home until they find their special someone, and it’s a joy to be able to be one of the people who provide them with everything they need until that happens. I love dogs and my job, and spending time with them isn’t a chore! Working Christmas Day means we tend to get a second Christmas with our families. It’s a win/win situation when you get two Christmas days, right? 4. Do you have any stories about dogs at the centre that you have become fond of? Where do I start? there are so many! First there is Mike, the Sponsor Dog. This will be our fourth Christmas together and I love watching him open his presents – he is so funny to watch! He devours his Christmas dinner and always has room for more! Then he goes out for a walk with some of his walking buddies and we have a snuggle before he finishes the day with a long snooze. He is just a joy to be around at any time of the year, but he does get extra excited on Christmas day by all the treats. Then there is Mr Branston Pickles, a gorgeous Crossbreed who will be spending this Christmas in his new home after being with us for two years. He is going to love being snuggled up by the fireplace, opening his presents in his new home. It’s what we work towards and makes the hard work worth it. Over the Christmas period we often see an increase of dogs being handed over, or even abandoned. Last year, Dogs Trust had nearly 5,000 calls from people wanting to hand over their dogs in the month after Christmas – and sadly we think this will happen again. Back on Christmas Eve in 2015, two strays found themselves with us, so we called them Twinkle and Santa. Twinkle was a nervous, small Lurcher and Santa was a friendly Shih-Tzu who became wonderful friends, and a favourite duo amongst the team! Then, in 2016 we met Mary, Gabriella, Melchior, Balthazar, Angel and Casper, our Christmas puppies! They were Staffie cross Lurcher pups who were an unwanted accidental litter, so they came into the centre to be looked after until we could find them new homes. They brought us so much Christmas cheer, lots of mess and lots of cuddles! And finally, there is Staffordshire Bull Terrier Peggy-Sue, my little Christmas cherub. She was a stray who arrived at the centre in June 2016. She quickly found herself a new home but sadly it wasn’t to be, so I started fostering her from late October that year. She spent her first Christmas with me, my partner, nan and grandad. We fell in love and adopted Peggy in October 2017, so she spent her second Christmas with us last year. I was working so she spent the day with my partner watching Christmas films and waiting for me to come home so we could open all our presents and eat our Christmas dinner together. This will be her third Christmas with us and we can’t wait! 5. What advice would you give to someone who is thinking of buying a puppy as a Christmas present? We would always ask anyone considering bringing a four-legged friend into their life to rehome a rescue dog. We have thousands of dogs of all shapes and sizes in our rehoming centres waiting to meet their special someone. We would never recommend buying a puppy from any online source, but instead to do your research thoroughly so you can be confident that the puppy you have your eye on has been bred responsibly. We have a wealth of advice on our website to help people be confident that they are buying a puppy from a good breeder, instead of a seller who makes a living pedalling sick puppies who may have been illegally imported into this country. We want people to realise that if an advert seems too good to be true, it probably is. And, when you visit a puppy you should expect the breeder to be as curious about you and the home you can provide, as you are about the puppy. If anyone ever feels rushed into making a purchase, they should walk away. It’s hard to do but it’s the right thing to do. If something doesn’t quite feel right, or anything about the situation feels dodgy – report them to Trading Standards. 6. How can members of the public help Dogs Trust at this time of year? There are so many ways that people can get involved at Christmas. We are always super grateful for any donations, and each centre has lots of different volunteering opportunities, so it’s always best to check our website to see what is happening at your local rehoming centre! Dogs Trust also runs a big fostering scheme for dogs who struggle with kennel life, so if this is something that might be for you, we can give you lots of information! I really enjoyed getting a look behind the scenes at what it’s like at the centre and I hope you did too. Later this month I’ll be bringing you another post about when S and I visited one of the centres, but for now, if you want to know any more, the Dogs Trust website is a great place to start. There is a lot of information on there, whether you’re interesting in rehoming opportunities, volunteering, or making a donation. If you have any questions, you can also leave them in the comments and I’ll make sure they are passed on. Body Shop – one of my firm favourites – anyone who’s been reading the blog for a while will know that I love mango products, and this mango hand cream is one of my favourites. So I’m really happy to have that in the calendar. Glossybox – something else that is going in the giveaway box! It’s the Real Techniques expert face brush for foundation. Interview with Gracie – what’s life like as a homeschooler? I’ve got an interview for you today, but it’s a bit different from my usual blogger of the month series. I can’t remember why or when I started following Gracie’s blog, but she has always struck me as someone who writes well, with passion, and a strong commitment to changing the world around her for the better. As I read more of Gracie’s articles, I learned that she is being home-schooled, and I had to admit that this is something that I don’t know very much about. There is a whole community of children and young people who are experiencing a completely different kind of education to the one that I received, and as most of us never come across these young people, mainly because our paths just don’t cross, we don’t know anything about them. 1. What’s a typical day for you like as someone who is home-schooled? In my family we like to say that for us everything is school, everything is a learning opportunity – real life situations, books, the internet, documentaries, conversations, being outside, helping someone else, just living our lives. Therefore, we never really have a typical day! However, on most days we do our school work which is a curriculum we’ve devised for ourselves based on what we’re interested in, what we’ll need in the future and what we think is relevant to our lives. 2. I think you said you have younger siblings – do you learn together with them, all do your own thing, or do you teach them sometimes? Yeah, I have a brother and a sister. When we were younger my parents would teach us a lot more often and so we’d do more projects together. Now that we’re all older and have different interests we tend to get on with our education ourselves, though it does sometimes overlap. A lot of the time I teach my siblings things I’ve already learnt or help them out if they’re struggling with something. 3. What are your favourite subjects and why? My favourite things to study are socio-anthropology (the social study of humanity), sailing theory and navigation, spoken word poetry and science of all different types. I just have an interest in learning new things and these are all things I’m working on for my future. I do think it’s good to learn a diverse range of subjects and skills that will allow you to live and make a difference in this world. 4. How much input do you have into what you will study? How do you decide what you want to learn about and what kind of projects you will do? I have a lot of freedom over my education. If there’s something I really want to learn, am passionate about and that will benefit me in the future (because essentially that’s what education is – preparation for the future) my parents will support me in studying it. 5. What do you enjoy doing in your free time? I love sailing, writing, having conversations with my friends, swimming/lifesaving, blogging, cycling, being outside, performing spoken word poetry and cooking/baking! 6. Have you read any good books lately? I do really like to read. I have a love of and a fascination for words and stories so, in my eyes, books are a whole new amazing world just waiting to be discovered. Some of my favourites are The Secret Life Of Bees by Sue Monk Kidd, the Swallows and Amazons series by Arthur Ransome, Where I Belong by Gillian Cross, Artichoke Hearts by Sita Brahmachari, The Order Of Darkness Series by Philippa Gregory and the Cherub series by Robert Muchamore. I recommend all of them! 7. What are three important things that you have learned since you became a blogger? 1. How important it is to be honest and open. 2. That you really can make a difference and meet like-minded people through blogging. 3. How important it is to have something to write about – to live an interesting, meaningful life. 8. Languages were my favourite subjects at school. Do you learn languages? If you wanted to learn a language that none of your family or friends could teach you, what would you do? 9. Is there a community of young people who are being homeschooled, or do you create your own community using your blog? I know LOADS of homeschoolers both on and offline. There is a huge, thriving, worldwide community of us – all with different views, ideas and ways of doing things. It’s so interesting and encouraging to interact with them all. 10. What is one common misconception that people have about homeschooling, and what would you say to give people the facts? 2. that we have no friends. Both of these are completely uneducated assumptions that come from people with little or no knowledge of the lives of homeschoolers. I usually just explain the truth: we work pretty hard on our education too and, believe it or not, school isn’t the only place you can make friends! 11. I read somewhere that the idea with homeschooling is that students study things that interest them. This sounds like a great way to get students engaged, but how about those things that you don’t enjoy, but have to do anyway? I’m thinking about my job – I love my job, but there are bits of it that I find a bit boring. I can think of situations at school when I knew I just needed to get things done. How does this work for you if you don’t have to study subjects that you don’t love? I wasn’t a big fan of maths, but do see why it’s useful! It really depends on your outlook, but for us…yes, there is a lot of emphasis on studying what you’re interested in, but we do also have to do our daily maths and science and writing and other skills that are necessary for us to thrive in a modern world. 12. Does any of your education take place outside? Yep, lots! We live on a farm/campsite and over the years a ton of our time has been spent in the fields, rivers, woodlands, tracks and farmland that are our backyard. When we were little we’d play out in the dirt and explore, then as we got older we’d grow vegetables, look after animals, learn about nature whilst in the very midst of it, cook out over campfires and even just use the outdoors as our classroom – a place to read or study. 13. What’s an interesting place that you have visited recently? We recently travelled up to Scotland for one of my sailing trips. It’s just the most beautiful country. We camped out for a few days on the edge of this loch where we could wild swim, watch otters, harvest and cook shellfish, create artistic masterpieces from shells, pebbles and seaweed, hike up mountains, go for stunning early morning runs and meet interesting local people all within walking distance! 14. Do you have to do tests or the same exams as people your age? As a homeschooler, you don’t actually have to do any of the exams that school kids do. Some of us choose to do them and some of us choose not to. We can do them whenever we like, at whatever age, so whenever we feel ready. Personally, I haven’t decided yet. I feel like these standardised tests are something everyone has and it doesn’t set you apart like life experiences or an alternative education do. However, they might be a good thing to have, just in case you ever need them. 15. Do you have any pets? We have a rescue partridge 😉 We’re just looking after it until it can be returned to the wild though. Then there’s loads of dogs, cats, chickens and ducks on the farm. 16. How important are the internet and online resources for your studies? 17. Do you have any opportunities to take part in group work? I am really into sailing and go on quite a lot of voyages where you’re on a boat with somewhere between 10-20 people who you live and work with 24/7. It’s a very intense experience and teaches you a lot about teamwork, tolerance and social situations. There are also a lot of home-ed study groups where people come together to learn something together. 18. What would you say is the main advantage of homeschooling? The freedom to be yourself and think differently without being forced through a system which is turning you into a product of modern society. Look around and you’ll see so many young people failed by the system which is supposed to prepare them for their future. Homeschooling shows you a different future, doesn’t pile on the unnecessary pressure and allows you to flourish with your strengths and work on your weaknesses without being branded a failure. 19. What is something that you would like to learn more about in the future? I want to work in sail training (charities that take young people sailing) when I’m older so I’d like to continue with my learning and understanding of everything to do with that. I’d also like to work harder on my Italian and to get better at performing spoken word. 20. Is there anything else that you would like to add/tell us? questions about homeschooling, please let me know, I’d be happy to help out! So, thanks again to Gracie for answering my questions. I know I learned a lot through reading them. If you have any questions, post them in the comments. I’m happy to discuss the different ways of doing things, as long as the comments are respectful. Also, why not pop over to Gracie’s blog A light in the darkness and read some of her articles? Author englishwithkirstyPosted on September 20, 2018 September 20, 2018 Categories Interviews, UncategorizedTags blogger interview, education, homeschooling, sailing3 Comments on Interview with Gracie – what’s life like as a homeschooler? Çiğdem Gül, one of my friends from Germany, recently interviewed me on her intercultural German blog. The article, “England – Kirsty Major speaks about blindness, giftedness and Brexit”, was published in two parts, as I had so much to say. They weren’t the kind of questions that you can answer in a couple of sentences. The interview has been published in English and German, but as most of my readers here speak English, I have linked to the English versions. So, if you would like to read the interview, part one is here. Thank you Çiğdem for your kind words and interesting questions, and also for the opportunity to share with your readers! Today I’d like to share something from Gemma’s blog – Wheel Escapades. Gemma interviewed me for her disability-related 20 question series. You can check out the interview here, and don’t forget to have a look at Gemma’s other articles while you’re there – especially if you’re interested in tea, accessibility, and travel. I think it’s really good to follow other blogs and learn about people’s accessibility needs that are different from our own. In other news, don’t forget that my Summer giveaway is still open – so why not have a look and enter if you haven’t already. The giveaway is international and it’s open until 15thJuly 2018. 1. What’s the link for your blog and how would you describe it in a couple of sentences? It’s The good, the fab, and the lovely. I have been blogging for about 3 years. I blog a bit about everything I guess: beauty, fashion, travel, books and lately I have also done some posts about food. Whatever interests me I blog about . 2. Have you always enjoyed writing, or did you only start recently? I have always enjoyed language, but I started writing blog posts about 3 years ago. Even though I am from Belgium (the Dutch-speaking part), I decided to blog in English as I thought that would attract more followers and readers.. I know I write mistakes, but overall I think I manage! Anyway, I’ve been learning heaps writing in English. 3. What’s one of your favourite posts from your blog, and why? I’ve been writing these ‘nostalgia’ posts recently like this one: Going back to the 90s and I certainly enjoy writing them as it is always a trip down memory lane 😊 I talk about my favourite events, music, books, games,… of a certain decade. 4. How do you make sure that you don’t run out of ideas? Where do you get most of your inspiration? I’ve got a notebook in which I write down all my ideas. I get my ideas from everywhere: magazines, other blogs, television,…Whenever I think something is worth writing about, I put it down in my notebook and when I need inspiration, I browse in it. So far I haven’t suffered from writer’s block… yet! 5. What would you say is the best thing about blogging? Oh I love everything about blogging! If I could I would make it my fulltime job! I like the writing, taking pictures, the interacting with readers and other bloggers,… I’ve been blogging for 3 years and haven’t regretted it a single minute! 6. What’s one of your most popular posts? Why do you think people liked it so much? My most popular post is one about a beauty product from L’Oréal, the Revitalift laser peeling lotion. I honestly wouldn’t know why this keeps attracting readers, but it sure is good for my stats! 7. If you were asked to put together a beauty and lifestyle box with 4 products inside, which favourite items would you put in? – Chanel n°5 as that is one of my all-time favourite perfumes. – Coconut oil:you can use it as a cleanser, as a bodylotion, to nourish your hair, with some sugar in it you can use it as a scrub,… i just love the versatility of this product! – Urban Decay Naked 2 eyeshadow palette… it really lives up to its expectations!! I love the shades, it has great pigmentation and there are just so many possibilities with this palette. 8. What’s one thing you wouldn’t have done or learned if you hadn’t started a blog? As I already said, my English has improved a lot since blogging. When I write a post I will also look up information about the brand, the destination,… so those are things I would otherwise not know. Blogging definitely broadens my mind! 9. Have you ever bought anything because a blogger was talking about it? Frequently! The Urban Decay Naked 2 eyeshadow palette for instance, a highlighter from Maybelline, a mascara from Rimmel, and many other things! 10. What type of posts do you most enjoy writing? What type of posts do you find hard to write? I love writing my ‘nostalgia’ posts. As I already said, they’re always a trip down memory lane! The travel posts are usually a bit harder to write as it takes me a bit more research. 11. Have you read any good books lately? Another book I really liked reading was ‘Afterwards’ by Rosamund Lupton. It starts with a fire in a school. One mother sees the smoke and runs inside as she knows her daughter is inside. Both survive, but are heavily hurt. Afterwards, the mother must find the identity of the arsonist and protect her family from the person who’s still intent on destroying them. Afterwards, she must fight the limits of her physical strength and discover the limitlessness of love. 12. Online shopping or going to the shops – which do you prefer and why? We do buy a lot of stuff online (books, shoes, clothes, even our fridge and dishwasher! ), but I must say that I like an ordinary shopping spree as well!!! 13. What’s a trend that you think should never be seen again? Braided brows… I mean… come on!!! 14. If you were in a hurry and only had time to apply 3 make-up products, what would they be? I would go for a mattifying foundation, mascara and lipstick (which I would use as blush as well!). 15. What do you need for the perfect night in? I looooove a night in!! I’d start with some tapas or some French cheese and wine. Afterwards I’d settle on the couch with a good book, magazine or travel guide, Netflix and some more wine! I also like a board game (ticket to ride!). 16. What’s one thing that you would like to do this year? Actually, I would like to have certainty about my job… at the moment there are major changes going on in our organization and even though I know I won’t be out of a job, I just want clarity on when/where but especially what!! Thanks again to Kathleen for answering my questions and I hope you get some good news about your job soon. To everyone else, be sure to check out Kathleen’s blog – you’re sure to find something you’ll enjoy. Welcome to the next instalment of my blogger of the month series. It’s a way for you to get to meet the people behind some of the blogs that I enjoy. Kerry is a regular commenter here and I’ve been a fan of her blog for a while, particularly her posts about make-up and skincare, and the ones in which she gets us thinking about real-life questions. I’m also happy that she recently started a skincare series as someone who works in the industry. Don’t forget to check out Kerry’s blog and show it some love! Hi, my name is Kerry and I blog over at Kerry Life and Loves My blog was once described as a Lucky Dip blog, as you can find anything over there, and its probably a pretty good description! I class it as a lifestyle and beauty blog, but I have been known to discuss my love of gin, living in a car and dancing in a field! I have always had a love of writing, and its a long running joke in my family that every thing that happens in our lives will end up in “my book” I have a million notebooks full of short stories, poems and chapters of a book I have written. I love writing and the dream is to finish the book I have in mind. I have only been blogging for 18 months, so haven’t yet run out of ideas! I think because I cover all subjects, I always have plenty to write about. I feel inspired by anything and everything. Anything from a song lyric, a quote I have heard or something that’s come up in discussion with my friends/family. I am a massive over thinker, so tend to want to pull apart and understand everything! I also have a huge love of make up, so often have products to be shared with my readers if I have loved something. I do sometimes have times when I sit down to write, and can’t make it flow. I just go off and have a cuppa, walk away for a little while. I have gained so much from blogging, far more than I ever thought possible. It has honestly kept me sane throughout my husbands cancer diagnosis and treatment, as well as being an outlet and focus for me in the dark days of his illness. I have met many, many wonderful people that I consider friends, and I love everything about writing a blog. Sorry, I went a bit gushy and overboard there haha! One of my most popular posts to date was a product review, which really surprised me. It was for a Bobbi Brown eyeshadow stick, and even now, almost a year after it was posted, it gets views every week. I have no idea why! Perhaps the SEO was just right on that post! Ohhh I would love to put together a box! Ok, I would 100% have a scented candle, I can’t personally get enough of them. I’d also have a Charlotte Tilbury Lipstick, an Environ Moisturiser and any one of the Urban decay Naked palettes. Starting a blog has taught me so much, as well as pushed me to come out of my comfort zone. I can be a little lacking in confidence, so making myself go to blogging events has been a huge challenge for me. It’s pushed me, I have had to dig deep at times, but I think it has taught me a lot about myself. I also know a little bit about SEO now, which is a miracle! Ohhh I have bought so much that a blogger has recommended, and in fact, I wrote a whole post on it last year. I am an easy sell. Being a make up junkie, I tend to fall in love with new products that are shown. Fleur de Force convinced me I needed a Chanel eye liner, Sam and Nic from Pixiwoo always convince me I need what ever they use as they are so gorgeous, and any book reviews always make me want to read the book! I’m a nightmare! I really enjoy posts that hopefully, give my readers food for thought. I am a talker, I love to talk late into the night with company, so if I can inspire discussion, encourage people to want to give their input, that makes me happy. I do find it harder to reveal too much of the inner workings of me, the more personal stuff, but I am getting better. I am a book worm and devour books! I love reading mystery/crime type books, and self development books the most. I have just finished a book called Then She was Gone and it was brilliant. I read it in 3 days. I also recently read the Jo Malone biography, which I really enjoyed. I like reading about people’s lives. I love going to the shops, we have to support our high streets, but funnily enough, everything I went to buy today in Lakeside shopping centre was out of stock. I’ve had to come home and order it. I do ALWAYS use a blogger’s affiliate link if they have one on something they have suggested and I am buying, we gotta support our fellow bloggers! 13. What’s a trend that you think should stay in 2017 – something you hope will go away this year? Ohhh I really would love to see the game playing on social media disappear. The follow/unfollow, the bots, the cliques. I just want it to all be fun and less serious. I could easily only apply 3 make up products, and if you have seen my “morning minger: moments on my Instagram stories, you would see a lot less than 3 products haha! my three would be mascara, lip balm and a bit of bronzer. My perfect night in would be a gin and tonic, fluffy blanket, maybe an Indian takeaway and my hubby and boys home. If its a night in with the girls, still gin and tonic, funny films like Bridesmaids or Identity Theft and lots of talking and laughing. The last 12 months for us have been tough. This year I would just like my hubby to be well, and us to have adventure. catch up on the things that were put on pause for a while. I’m full of hope for this year! Thanks Kerry for answering my questions and I hope that this year will be a wonderful one for you and your family. I have a big plastic box that’s full of cards. Cards that people have made for me, that have special messages inside, or that I just can’t bring myself to throw out. The oldest ones are a birthday card that a teacher made me when I was five, and a card I made for my grandparents’ anniversary that has a smiling piggy on the front. I’m not sure about the connection between wedding anniversary and smiling piggy, but it made sense to me at the time. I like receiving cards, but as many of them feel the same, I really appreciate it if someone goes to the trouble of finding one that is tactile or which has Braille writing inside. However, this isn’t always easy to do, and although I think there’s a bit more on offer now than when I was a child, most of the cards in the shops don’t have any special features that can be appreciated by someone with partial or no sight. Understanding what’s written inside is another thing. It’s easier now that I live with S, but in the days before Facetime, I remember trying to get an image of a card with my phone so that I could text the message to my Mum and find out who had sent me money in my Christmas card! That’s why I was interested to hear about Lynn Cox and her range of tactile Braille greetings cards. I first met Lynn through an online forum for self-employed visually impaired people. I wanted to find out more about the cards and tell you about them too, so I arranged an interview with Lynn. Lynn also sent me a sample of her work. 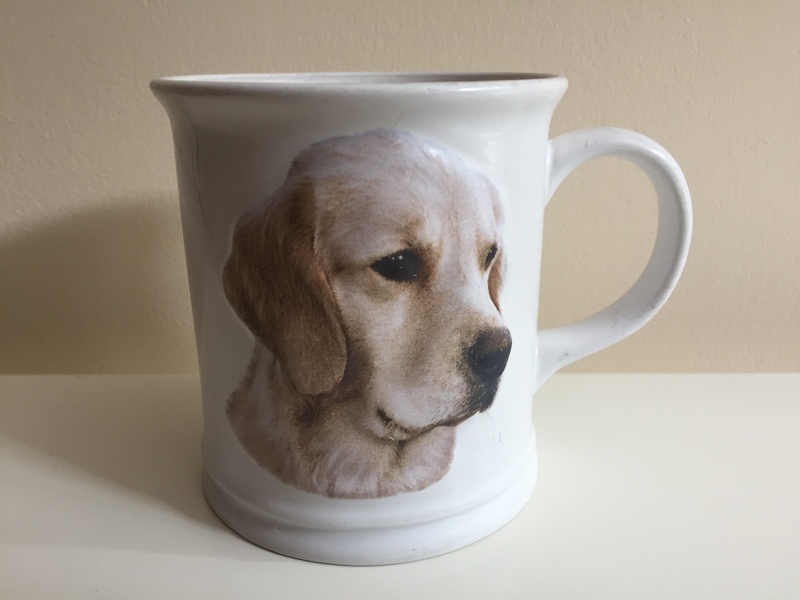 Knowing that I love dogs, it’s one of the dog range, which can be made up for any occasion. The dog on the header image is on a Christmas card. Mine was on a Valentine’s card, and the design can also be used to go on other cards such as birthday, thank you etc. The first thing I noticed was the perfume scent coming out of the envelope because these tactile cards are scented too! The dog is running after his ball, and I can feel his furry outline – his legs as he’s running, his waggy tail, his furry snout, and his ball. The message on the front and inside is in Braille and printed on the card. Lynn’s details are on the back, also in Braille, and personal messages for the recipient can be added on request. I think it’s such a lovely idea and would encourage anyone with blind or partially sighted friends, children, colleagues or family members to check out Lynn and her cards. The cards start from £7, (there are additional charges for larger or custom-designed cards). That’s not much more than what you pay in the shops, and when you consider that you’re buying something that is hand-made and with additional touches that you can’t get in the shops, I think it’s very good value. Here’s what I found out when I Skyped with Lynn a couple of weeks ago! It’s a good thing we skyped too – there was a lot of snow that day! Why did you decide to start making tactile greetings cards? I decided to make the cards because there were no quality products out there for people to buy if you wanted something tactile, scented, or with large print or Braille inside. Also, as an artist, I was using my skills to exhibit artwork but none of it was affordable for people to have as a day-to-day product. Can you describe one of your cards in terms of tactile features, writing inside, scent etc? The dog one is a popular one. It’s a dog playing with the ball, running along with his mouth open. I use Contrasting coloured paper for the card, and then draw with wool to create a line image of the dog and the ball. I like to look for very fluffy wool for the dog. He wears a little leather collar with a bell that jingles, and has a leather ball – so you have a variety of textures, the smell of the leather, and the sound of the bell. I also use little gem crystals to decorate the ball. I like to use shapes that are easy for people to recognise by touch, such as the Christmas tree with a star on top. I also like to experiment with textures. I have a card with a guitar on the front, and I use metal for the strings. Do you put Braille in all your cards? All of the cards have messages in Braille and large print. There’s usually something on the front, such as “happy Easter”, something in the middle, and my contact details on the back. How about the message inside the card? I can add a personal message, either in Braille or in print if you send it to me with your order. Do you send the cards directly to the recipient? It’s up to you. I can either send it back to you, so that you can post it off yourself orgive it to the person, or I can send it directly to the recipient. Do you send the cards internationally? Yes, my cards go all over the world, although of course sending them internationally does mean that I need to know a bit further in advance as the post will take longer. What other occasions do you make cards for? My Mother’s Day cards are usually flowers or hearts. I spray them with some perfume as well. This won’t last for ever, but it’s nice for the recipient when they first open it. I put a man’s scent in if it’s for a man. If you want one of the designs I already have, like the flowers or the dog, you can change the message on the front. If you want a whole new design, that would take longer and cost a bit more because it would be custom-made. I think this is the first scented card I’ve come across. What do you do for Christmas cards? I have an oil that smells like a Christmas tree. It’s pine with clove and a hint of ginger. Do you make all of the cards yourself? Yes, they are all hand-made. No two are ever exactly the same because I’m always on the look-out for new materials to use. Why do you go for simple shapes? I want people to be able to recognise them without having to ask what they are. You get some Christmas cards with a fire in the grate, a mantelpiece with cards on top and Christmas decorations hanging from it. But if there is too much detail, the individual shapes can get lost. Do you have any special Easter cards? I have one with 3 Easter eggs on it, all made of different materials. One of them has a fluffy chick coming out of it. Then there’s an Easter bunny with a big fluffy tail and long ears. How do you make sure that the shapes are right? I use things like reindeer toys or cuddly toy owls. I still remember what a lot of things look like and tactile props like the toys help me to check things like reindeer antlers! What cards do you want to make in the future? I want to do a cat one! I love animals and a lot of my normal artwork is around animals such as horses and sheep. I also like doing musical instruments. Where can people find out more about your cards? You can go to my website. Or, if you want to ask me a question, you can send me an email. Thank you Lynn for letting us know about your cards and I highly recommend that you go and check her out if you have anyone to buy cards for who is visually impaired. And yes, if my friends and family are reading this, I’d love to get one! If you see this before 9th April 2018, why not also check out my Spring giveaway? I started my blog over a year ago now, my, how time flies! I could never decide on a niche for my blog, so I decided to blog about a wide range of topics that are of interest to me. My favourite things to write about include: beauty, blogging tips, fashion, lifestyle, out and about and recipes- phew! I used to enjoy writing a lot when I was a teenager; I remember I used to love writing poetry and short stories. My blog is the only thing I write at the moment, though. Can I pick more than one, please? My favourite posts are titled ‘My Home: One Year On’ and ‘Holiday In Ibiza’ because they are the most personal to me- they are really nice to look back on as they bring back memories. I had an almost blogging break in February because we all run out of inspiration sometimes. If you feel like you need a break, have one- it will benefit you more in the long-run. But apart from that, a friend and other bloggers inspire me to keep going. As a person who’s never really had a hobby before, I’m proud to say my blog is my hobby! My most popular post is the one where I talk about my Facebook group, Blogs In Bloom; this post is most popular because I upload it once a month to reach new followers. I have a haul post which includes homeware, beauty and fashion items- this is my 2nd most viewed post. It’s so difficult just to pick 4 items! 1) a cute leather purse, 2) Benefit Roller Lash Mascara 3) a fancy candle 4) Liz Earle Hot Cloth Cleanser. Honestly, I have already learnt so much along the way with this blogging journey! Even just learning how to use WordPress is an achievement on its own. Good question! I always read blog posts by others and lust over the pictures, and appreciate a good write up. I have a mental wishlist, but I don’t think I have bought anything recommended by a blogger- yet! I love working with brands, but I find those posts most difficult to write because I want everything to be just right. My favourite posts to write are lifestyle and spontaneous posts that you can’t wait to write. Reading is definitely a seasonal activity for me that I like to do in the summer- you can’t beat taking a book outside in the sun! I’m a sucker for a girly love story, so I loved reading Me Before You by JoJo Moyes last summer. I like to browse online, but I like to make my purchases in store. It’s just nice to get out of the house, isn’t it? I honestly know nothing about trends, so I can’t answer this question- sorry! I love a night in (every night!). A relaxing bath, a glass of wine, chocolate, music and candles make a night in perfect for me. When the weather warms up, I am going to be on a mission to get out and about and visit lots of new places. Thanks Emma for answering my questions and I enjoyed getting to know you a bit better through this post. Don’t forget to check out Emma’s blog, and for those of you who are bloggers, I can definitely recommend her group. It’s one of the most friendly places on the internet when it comes to bloggers getting together, encouraging, and helping each other out. Welcome to the second instalment of my blogger of the month series. It’s a way for you to get to meet the people behind some of the blogs that I enjoy. You may remember Joanie and Sazzy from my Blogger swap box post. That was a lot of fun! For anyone who doesn’t know them, S & J blog over at The Cozy Den so go and check them out if you haven’t already! This is our blog! We’d say that our blog is a creative outlet for everything we, two 22/21 year-old German girls/women (what even are we? Young adults?! ), are interested or passionate about. So what you’ll find there is a wild mix of fashion, beauty, lifestyle, food, books, TV shows, personal stuff… the list goes ooooon and oooon! Funnily enough, neither of the two we chose are online yet because they are quite personal and we haven’t put them online yet (will do though after exam season). So our favourite one that is online is our second ever post which is a review of the Jelly&Gelato range by Zoella. You can find it here.
. It is our favourite because it’s the one we met up for and took the pictures and everything together which was a lot of fun (we sadly haven’t had the time for that ever since). We are two people, so that helps 😀 Other than that, we draw from our personal lives and experiences or get inspired by other bloggers. And there are always new fun recipes or products you can try and share your thoughts about! Doing this together? Very cheesy, but true. And friendships in general. We’ve made many new friends within the blogging community who also like to share their thoughts and feelings and be creative! S.: I’d go for The Body Shop’s Tea Tree toner and the book ‘The Alchemist’ by Paulo Coelho. J.: I would put in a Fitbit Charge 2 and a highlighter from Tanya Burr Cosmetics. There you go, the ultimate Cozy Den Box by Joanie and Sazzy! It takes up much more time than we thought! We really do struggle keeping up with social media and the pictures. But it is part of the challenge and we enjoy taking it on! The harder ones are the ones that are more personal or the ones where you need to pay attention to political correctness as to not offend anyone (we want our blog to be a safe spot for everyone) and also the ones for Blogmas or Blogtober where we had to think of childhood memories (it’s so hard!). Yes, The Alchemist by Paulo Coelho (10/10 would recommend, very inspiring) and Atonement by Ian McEwan (10/10 would recommend, very gripping). We both agree on this one: it depends on the circumstances. Shopping with friends? Let’s go to the shops! Shopping alone? Let me stay in my cave and put a lot of items in my bag only to delete them later on because the order is getting too expensive! Glitter lips and feather brows. Byeee! We’re not feeling either. We also heard that loon trousers (we hope this is the right word, we’re Germans after all and sometimes Google is all we have – we’re talking the opposite of skinny jeans) are coming back and honestly, we hope they don’t. Funnily enough, again we agree on the exact same things: concealer, mascara and bronzer! J.: The Mentalist, pizza and cosy clothes. S.: Netflix, tea and cosy clothes. J.: Moving in with my boyfriend! Thanks Sazzy and Joanie for answering my questions and I hope that J’s move goes well and that S’ holiday is a lot of fun! Looking forward to your next posts and to everyone else, don’t forget to go and check out the Cozy Den! Welcome to the first instalment of my blogger of the month series. It’s a way for you to get to meet the people behind some of the blogs that I enjoy. We’re starting with Janelle from TheNellyBean – so if you haven’t done so already, I’d recommend that you check her out – after you’ve read her answers of course! I’m over at The Nelly Bean and my blog is all about beauty, life’s funny moments and my experiences as a music teacher. Me in a nutshell! I’ve always loved writing since I was much younger, and always felt like I could express myself better through pen and paper rather than verbally. I’ve learned how to function socially as a human being since then (hopefully) but I still feel the same way about writing. Probably my post called Rambly Ramblings, which was written after I’d been away from blogging for a long time – life gets in the way sometimes. I felt as if I was just emptying my thoughts when writing it and it felt so natural – for me, that’s what blogging is all about. I always keep a little list of drafts to hand, and always brainstorm ideas for blog posts when I have a bit of spare time or when I’m feeling particularly creative. Most of my inspiration comes from observations in real life or thoughts that cross my mind during the day (or night). Being able to have a platform dedicated to the expression of anything and everything you fancy. It’s like having a blank piece of paper – terrifying yet so exciting. My post called 10 Thoughts I Have Whilst Putting Makeup On – I felt like I couldn’t be the only one having these random thoughts whilst doing my face and it turns out lots of other people could relate. I’d go with the NYX Blush in Taupe (absolute saviour for contouring), a big bar of Cadbury’s Dairy Milk, a red tinted Vaseline and a pair of fluffy socks. Those four never let me down. I would definitely never have realised the sheer power of social media, and I would definitely not have learned to navigate WordPress. I’m far from good at it and coding still baffles me, but I’ve come a long way. Yes – the NYX Lip Lingerie in Exotic. Now I’m another blogger who raves about it and I have zero regrets. 10. What’s your most recent post? It’s called 5 Things I Have Learned In 2018 (So Far). Short and sweet one, I was feeling retrospective. I’ve been meaning to read The Picture Of Dorian Gray – maybe when uni work calms down a little. I tend to go online to do my research but I almost always prefer to buy in store. Maybe I’m old fashioned, but there’s nothing quite like being able to try the product for yourself – especially when it comes to jeans and makeup! My laptop, fluffy socks and a massive mug of lemon and ginger tea. I’d love to say yes to more things and take more chances. And be hella proud of myself for it! Go for it – I hope 2018 will be a year full of new opportunities for you Janelle, and to everyone else, don’t forget to go and check out her blog!